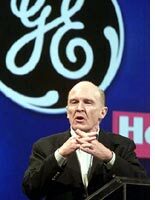 --former GE chairman Jack Welch, who no doubt reached more than his share of people deep in their souls, many of them, alas, through the medium of a pink slip during his infamous "Neutron Jack" days. How someone who made money by using his employees pension fund and firing them every four years before they can be vested became so admired in our bus. community explains why our bus. leaders have no problem justifying all their short term planning and lack of vision. It shows such a lack of courage and leads all of us down to becoming a service industry nation. For me, Welch is an endlessly fascinating guy on many levels. No matter one's politics, you have to admire certain parts of his legacy. He did understand people and how to motivate them as few CEOs ever did. And he did have a better grasp on how to keep a giant organization in a state of perpetual innovation like few others. But as you say, Daniella, there are certain parts of his record that make it difficult to respect the guy, much less stomach the hero worship that still clings to him (when he came to Cleveland last year to speak at a quality conference, the absurd three-figure price tag to hear him made one think he was still in charge of GE, rather than a retiree). The way he fought the State of New York over GE's documented century-long degradation of the state's environment till his last day on the job was only one of many black spots on his record. I think his rep was further soiled by the outrageous gold-plated perks he contractually retained in retirement, which became public as a result of a messy divorce. The good news: the company had to revoke many of them in the resulting outrage.